This haircut has been one of the most popular for men over the past couple of years… and it isn’t going anywhere. For this one, I was joined by my friend – and fellow YouTube creator – James Welsh. 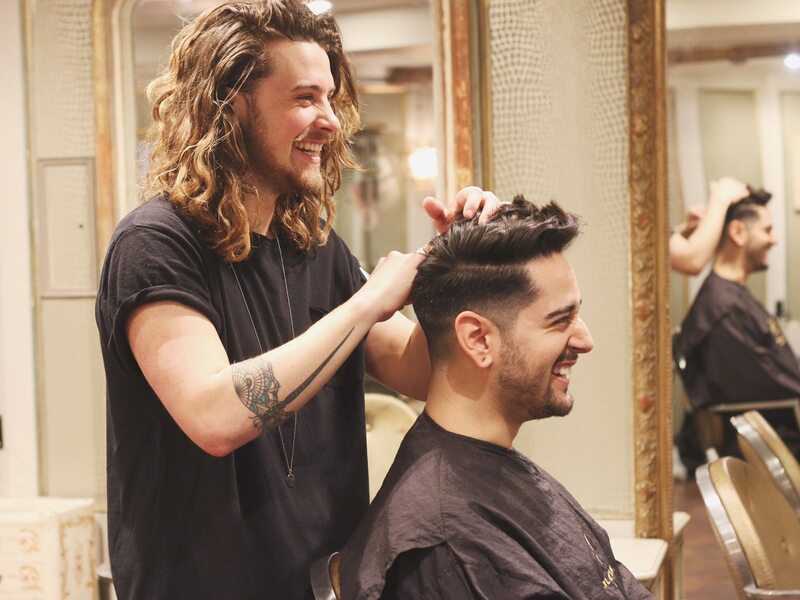 I took James to Taylor Taylor on Commercial Street in east London for a hair shape up and style with senior hairstylist Nick Jones. Clipper grade fade from 0 into a 0.5 and then 1 on the back and sides. Top kept long but cut horizontally to take off some weight. Nick creates a high horseshoe section, to divide the top from the back and sides. Because James’ hair is already quite short, Nick goes straight in with a clipper grade 1. He then goes in for a half grade and then a zero to fade it up. The hair is left weightier through the recession area. Nick works in horizontal sections on top, not taking too much of the length off. While still slightly damp, he slices through the hair to remove some of the weight. Nick uses Davines Hair Milk as a leave in conditioner. He then uses Davines Curl Building Serum. Using it as a base, he starts to dry the hair to build a curl. As he’s drying, Nick uses a comb to bring out more of a curl in the hair. He uses the Medium Hold Finishing Gum to bring out more texture in the hair. He fixes it all in place with a medium hold hairspray. Hair cut by Nick Jones at Taylor Taylor, 137 Commercial St, London. Check out James’ YouTube channel here.